Virtual Reality (VR) is a burgeoning industry and the big media companies - Google, Facebook, and Microsoft among them—already have money and experts engaged in figuring out how VR will impact our lives. Last spring, School of Cinematic Arts students launched their own expedition through a new club, VRSC (Virtual Reality SC), to explore virtual reality together with their peers from Viterbi, Marshall, and Annenberg, who are also passionate about this groundbreaking new medium for storytelling. School of Cinematic Arts senior student Lindsey Townley (Animation, 2016), the founder of VRSC, believes there will be many opportunities for young storytellers in the VR industry. Townley began to think about launching a VR club after a volunteer experience. She was working at the Entertainment Technology Center at USC, helping with a VR event. There, Lindsey met experienced VR developers and media artists. She was surprised by the huge potential of VR and, equally important, deeply touched by the level of collaboration in the VR developer community. Townley suddenly realized, “it was still hard for students at USC to find a place to meet and talk about VR, to get involved with VR.” That motivated her to start VRSC. “The goal of VRSC is to create a community of students, staffs and faculty, who are interested in virtual reality, interested in learning more about it, interested in developing it,” she says. Students who sign up for VRSC need to find teammates and facilities to create VR projects. VRSC improves their chances of creating great projects by hosting a “developing night” every Wednesday. This semester, for example, they’ve already held seven events, including tutorials and workshops, as well as a VR job fair and project pitch nights. On pitch nights, those who are looking for partners have a chance to introduce their projects, and recruit other talented students to work together. To connect students with industry professionals, VRSC invites leading artists and VR companies to participate in these events. Jyotsna Kadimi, a graduate student from the USC Viterbi School of Engineering with major in electrical engineering, is doing an internship at ABC Television Group, and has been working on VRSC Industry Relations. One week, she brought in Max Pittsley, lead developer of the award-winning VR game, ElemenTerra, as a guest speaker to give a VR Unity tutorial on the developing night. ElemenTerra, in which players can create new worlds (“rebuild the universe”) started out as a student project at USC and is now a startup. Townley is working on her graduation project, a live-action VR film called Children of the Moon. It is an abstract narrative work, combining live action with visual effects, to tell Plato’s Myth of the soul mates. She uses a specialized VR camera with 16 go-pros provided to SCA by the VR company Jaunt, and shoots in a 360-degree green screen, with Motion Tracked visuals. Townley is aiming to bring the audience into the minds of two dancers featured in her film, in a way that provides an immersive experience about love and fear. Townley is among the first SCA students who are able to apply the latest VR technologies in their thesis projects. SCA and Jaunt are launching a new incubator, the Jaunt Cinematic Virtual Reality Lab, to give more students the chance at hands-on creating using VR. As founders of VRSC, Townley and Ferrer both perceive VRSC not only as a group for VR developers but also a community rooted within SCA, for students from different backgrounds who share the same enthusiasm for VR. Animation students are able to create the puppet models in a VR project while Viterbi students are good at programming and troubleshooting. They all need suggestions from Marshall and Annenberg students about business strategies. Professor Andreas Kratky who teaches in SCA’s Media, Arts + Practice Division attended VRSC’s opening night. He said even though it might be still too early to tell if VR will be the next dominant medium for storytelling it is always great for students to try new technologies, and to see and try the possibilities. Compared with the old days, he says, it is much cheaper to get a VR device— for both developers and users—and points out that there are opportunities in the field beyond filmmaking and gaming. Virtual Reality is seen as an entering point to conceiving and creating new worlds, an opportunity to play on the imagination or to have a better sense of reality happening in distant places. More and more people are eager to explore the realm. Students at SCA are seizing the opportunity to work with other talented minds, through communities like VRSC, to really create something and engage in this new production world. 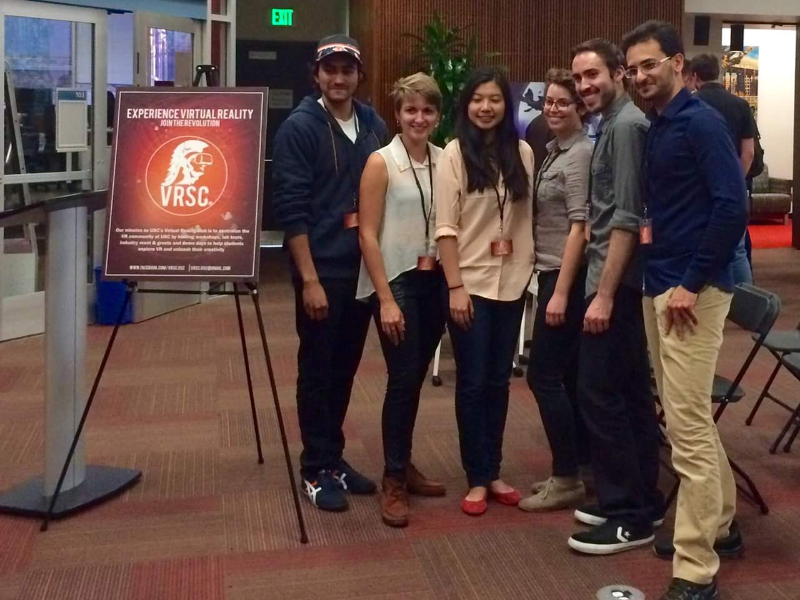 In April, VRSC will hold a student VR festival at USC. It will be a fair for VR companies to showcase their content and software to students. And for the students it’s a chance to present their works and insert their presence in the industry.